Classic K'NEX Ball and Socket joints are similar in concept to K'NEX hinges, but they have the major advantage that they allow movement in three dimensions. 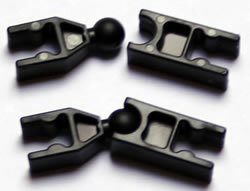 Ball and socket joints can be bought separately as "clips" in our K'NEX shop. The photo opposite shows the standard K'NEX Ball and Socket joint. This is supplied as two separate components, as shown at the top of the photo - the Ball and the Socket. A Large Ball and Socket joint is also available, as shown opposite. This is stronger than the standard Ball and Socket joint.